With more open jobs than available workers, who will fill the positions? "It's a candidate's market right now." "It's a candidate's market right now," Michael Fraccaro, Mastercard's chief human resources officer, told NBC News. Not long ago, college students wanted to know what they'd get as employees. These days, when Fraccaro hits a campus, "80 percent of the questions I get now are not about the kinds of pay and benefits we have, but how we contribute to society." The employment market has changed since the economic crash in 2008. Filling positions has become a challenge that could negatively affect the economy. Companies and experts alike are left to wonder where the new workers will come from. 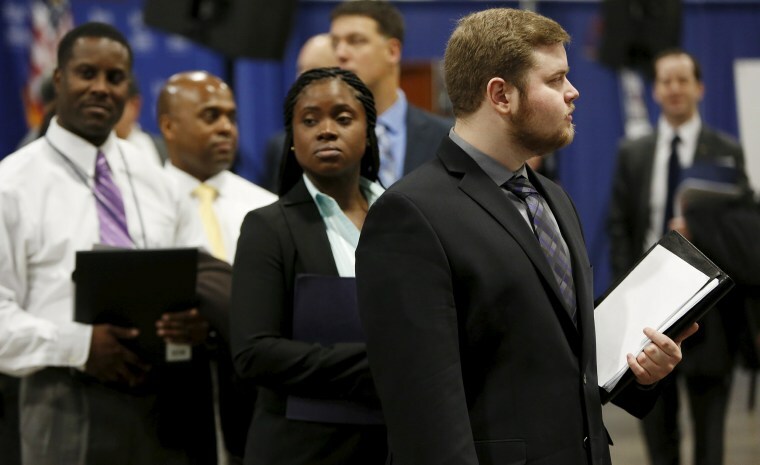 "The U.S. economy is at full employment, so we would expect to have balance between job seekers and job openings," said Eric Thompson, associate professor of economics at the University of Nebraska-Lincoln and director of the school's Bureau of Business Research. Part of the problem is demographics and labor market growth. The U.S. birth rate has been falling and is at a 30-year low. Simultaneously, baby boomers have hit retirement age, a big force behind the falling number of unemployed. The labor gap is not monolithic. There are two markets, according to Brian Kropp, group vice president for the HR practice of market research firm Gartner. One has highly skilled and educated candidates. The other, people with less education and few skills in high demand. "For in-demand jobs, more than 25 percent of them have been open for more than five months," Kropp said. "On the other end of the spectrum, those are still very much an employer's labor market, where there are fewer jobs than people." The dichotomy is why even with an overall unemployment rate of 3.8 percent, those without a high school diploma face 5.4 percent unemployment, high school graduates are at 3.9 percent, and people who have a bachelor's degree or higher have a 2 percent rate. Exacerbating the problems is a geographic mismatch between workers and jobs. "I'd rather stay established where I am than take the risk to move someplace new and potentially have that company struggle, have another recession, and be one of the first people let go," Kropp said. Employers have tried offering more. "Companies are willing to pay people who have master's degrees in artificial intelligence $400,000 to $500,000, and those are people with no work experience," Kropp said. "The majority of the workforce does not have those skills." There's also a need for skilled tradespeople, "especially maintenance technicians who go out and fix the pump or motor or transmission," said John Malloy of Sanford Rose Associates, an executive search firm. But the growth is all at the top, which is why median wage growth — the middle of the pack — remains low. However, bidding higher for talent only works for so long. Mastercard is retraining employees for more needed skills. Some parts of its finance department have been automated. "We've retrained [the replaced employees] to be the developers or coders for those activities," Fraccaro said. Jeff Zinser, principal of Right Recruiting, thinks companies will also need to change other practices in order to find people. Too many have the attitude, "we have the luxury of time because we are the employer," so they are slow to hire good people, who then get other job offers. "That's an issue of attention to detail and decisiveness." "There are also conflicts between the realities of the labor markets and the expectations of leaders," Kropp said. They set demands too high for the wages they're willing to pay and don't recognize that applicants have other options. Smarter companies are embracing flexibility — recognizing, for example, that hackers without a college degree may still be good candidates for cybersecurity jobs or that drug testing may be too extensive. And then there is immigration, which could bring needed labor at all levels. "It's extremely important now that we have the discussion around immigration and a quick-step path to employable status for people here without legal status," said Phil Noftsinger, executive vice president at CBIZ Employee Benefits. But changing immigration policy will depend on political agreement in Washington.